* ... BAD BEHAVIOR: Nothing like a half dozen police cars screaming by your house and a helicopter hovering overhead with a floodlight to get your attention. This was downtown, early Saturday evening, and I followed the sirens to Jastro Park where paramedics were busy trying to save the life of a gunshot victim. 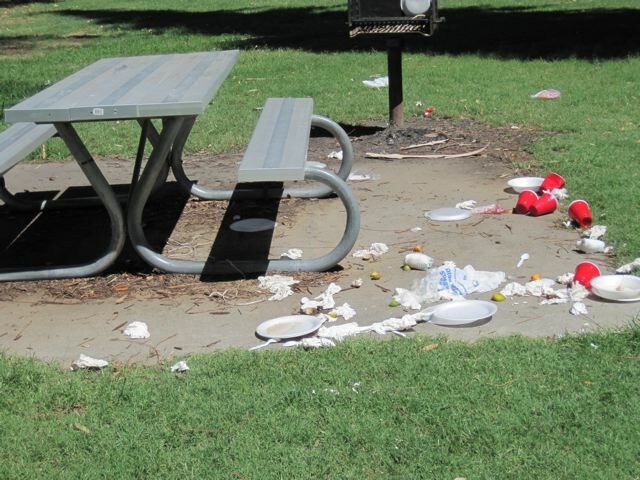 Turns out a group of African-American families were winding up their picnic when a confrontation ensued with a group of Hispanic men on the other side of the park. "Everything was okay and then someone pulled a gun," one woman told me. "Must have been five or six shots. We had 50 babies here and we just got them out of the way." Police said the Hispanic man was shot twice and later died. 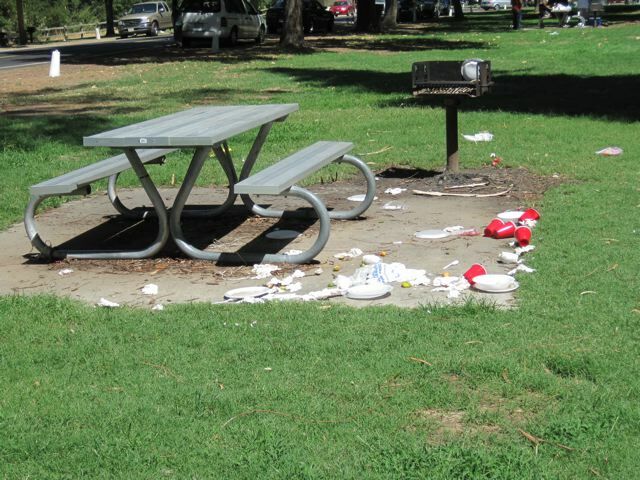 Let's hope this isn't a prelude to a bloody Labor Day weekend. 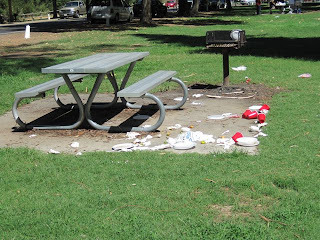 Meanwhile, reader Bonnie Farrer sent me a few pictures of Hart Park, totally trashed after weekend picnickers chose to ignore the trash bins and just leave their garbage on the ground. And so it goes. * ... LA CRESTA: More reader feedback on the old air field that was located between Bakersfield College and Greenlawn Mortuary and Cemetery in La Cresta. Brian Landis sent me a note saying he researched it at the Beale Library a few years back and recalled it was built during or just after World War I by the Army Signal Corps. "In the early bi-plane days planes had limited range so numerous strips were built up-and-down the west coast. Every single day in the 1920s the Air Corps would go on patrols along the coast. The La Cresta strip was used basically as a safe place to land when needed and to refuel. I do believe, if I remember correctly, even the legendary Hap Arnold flew from La Cresta. Why were bi-planes patrolling the coast daily, especially here in Kern County? The newly created Elk Hills Naval Petroleum Reserve would be a valuable target to an enemy attack potentially crippling the Navy's ability to defend the coastline. If somehow an attack were mounted by a sea-borne dirigible or float plane they could intercept it further away from the enemy's objective. Japan was seen, even then, as a military threat and very imperialistic after recent and unprovoked wars with China in 1895 and Russia in 1904. The La Cresta strip was also the first home of the Bakersfield Smokers holding drag races until encroaching home development led them to an auxiliary strip near Maricopa, then finally to the Famoso strip in 1954." * ... OVERHEARD: A middle aged man remarking on the movie 'Eat Pray Love' starring Julia Roberts: "Fifteen million people are out of work and Hollywood produces a narcissistic, self-indulgent movie about a rich woman trying to find herself. They should have made this in 2004." * ... QUARRY: More feedback on the old quarry at the Kern River and the 24th Street Bridge. Jerry Sutliff, a member of West Rotary, noted that he too nearly drowned there in 1946 when he was just 10 years old. "My friend, Jimmy Gleason, and I had to extract ourselves while our adult 'supervisors' were sitting across the river drinking beer. Sometimes I get a chill when I cross the 24th Street bridge." Another reader, JOSCO Construction owner Larry Sughrue, said he plastered a lot of sand out of the quarry. "The holes were dredged by Hartman Concrete. That was around 1948-1950." * ... PETLAND: I never visited Thompson's Petland downtown but from the amount of feedback I have been getting, it must have been a popular place. Patti Bailey wrote that it was owned by a Mrs. Pierucci. "An interesting note is that her son, Greg Pierucci, owns Advanced Automotive, corner of 22nd Street and M Street downtown, He has been our mechanic for 18 years, long before he owned Advanced Auto, and he is the best. He is honest, generous and knows his business!" * ... BAKERSFIELDISM: You know you're a Bakersfield old-timer if "you were standing in Elm Grove at BHS when they announced that President Kennedy had been assassinated.